The next big Splatoon 2 update has arrived. Following today’s earlier announcement, Nintendo has launched version 3.2.0 for all players. Today’s update adds support for the new Pearl and Marina amiibo. 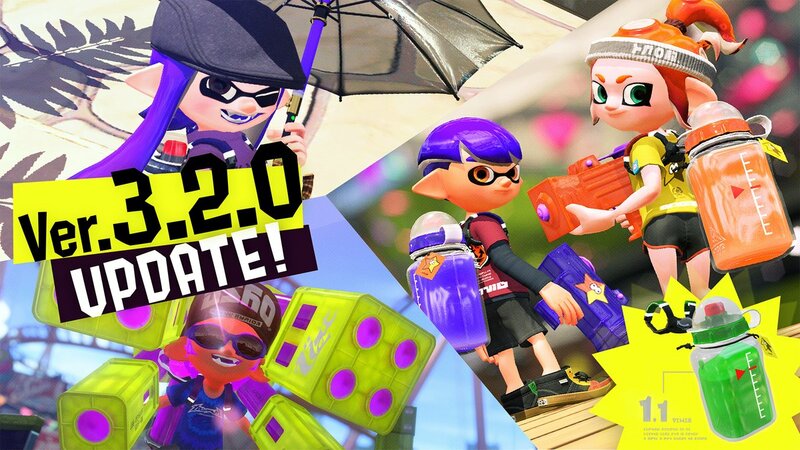 There are also a ton of changes for weapons, Octo Expansion, and more. Fixed an issue in Rainmaker causing the Rainmaker’s aiming reticle not to appear in the correct location when targeting an opponent’s Brella, Splash Wall, or spawn point barrier. Fixed an issue in Clam Blitz causing the match to very rarely end suddenly when, during overtime, the losing team successfully threw a Power Clam at the opponent’s goal. ” Fixed an issue causing Clam Blitz rank to incorrectly display as S+9 on the screen displaying Rank X positions for the previous month when a player has attained Rank X in any mode other than Clam Blitz and also has a Clam Blitz rank of between S+0 and S+8. Made an issue, in which Maws would appear to not be attacking on the screens of some players, though it was attacking on another player’s screen, less likely to occur. Fixed an issue causing a Goldie to disappear from a certain player’s screen while still visible to other players, during Goldie events. Fixed an issue in Marooner’s Bay causing players not to drown when the water level returns to normal height if they were standing on the location the egg basket appears during a low tide. Fixed an issue in a cut scene near the end of the expansion causing a character’s outfit to glow more than originally intended. Fixed an issue causing the “hair” of Octoling Boy characters to stick out in unintended ways when the Samurai Helmet was equipped, depending on the hairstyle.